19340 ft (5895 m) Highest point in Africa . Kilimanjaro is far and away the highest and most famous volcano in Africa, a splendid solitary snowcapped giant rising above the plains near the border of Tanzania and Kenya. 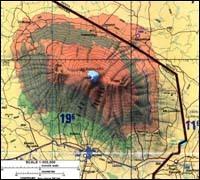 The huge mountain massif, about 50 miles (80 km) long and 25 miles (40 km) wide, is made up of three overlapping volcanoes. 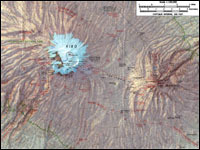 The oldest and least prominent is Shira at the northwest end, followed by the eroded rocky spires of Mawenzi at the southeast end, and dominated in the center by Kibo, a youthful cone topped by a broad 2 mile (3 km) wide caldera with a deep pit-like 1/2 mile wide (0.8 km) central crater and ash cone. 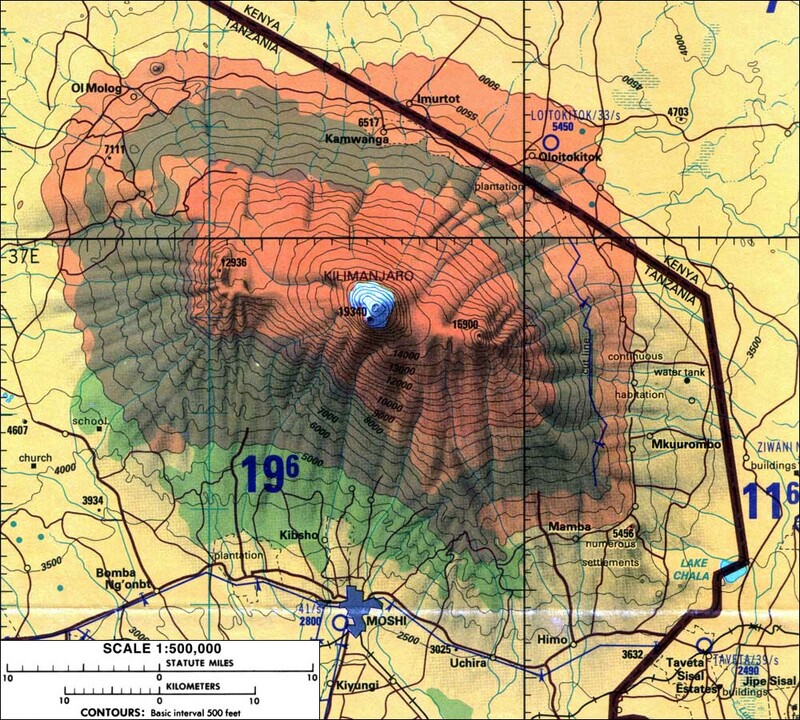 The famed glaciers of Kilimanjaro all flow down from the rim of this caldera, both inward towards the central Reusch Crater and outward in nearly every direction. 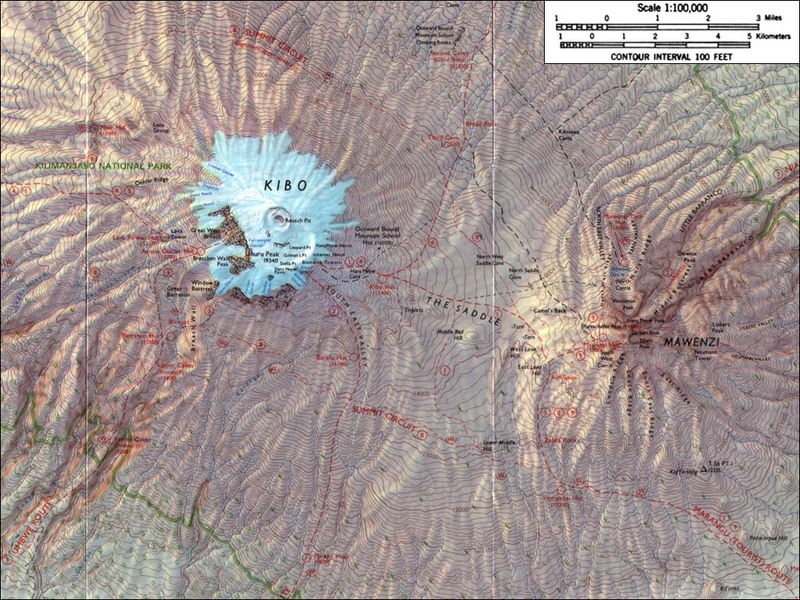 The glaciers on Kibo have lost nearly half their area in the past century, now extending down only to about 16000 ft (4900 m), and those on Mawenzi have disappeared entirely, reduced to a few icy patches in the steep gullies. Kibo is an extremely popular and non-technical ascent by several standard trekking routes, although several steep and dangerous ice routes do exist around the Breach Wall, a massive cleft in the south side formed by an ancient landslide. 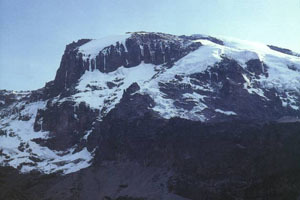 Mawenzi has no easy routes, with mixed rock and ice climbing needed to reach any of its central spires, and so it is an unpopular climb despite being the third highest peak in Africa. The glaciers on Kibo have been skied many times, since at least the early 1990's and probably much earlier, although these routes often end at hazardous vertical icecliffs at the glacier termini, and descents over 2000 vertical feet (600 m) may still be possible following a deep snowfall. Note that skiing (and all other non-hiking/climbing activities) are officially banned by the bureaucrats who run Kilimanjaro National Park.